Last year was a big success. Be there this year to pray and show your support. Pray, fast and do penance for an end to abortion. UPDATE: Ubis est Orbis Catholicus? Find the photos here: http://picasaweb.google.com/home?source=bloggerpromo&pli=1&gsessionid=9mn5Oo9ULfslK_MktPBntA. Restauravit et ornavit a.D. 2009. AP photo from the Internet. "He [Pope Paul] wanted to abolish the special chair which carried him on four [um, actually it was more than four] mens' shoulders, but no solution was found to allow the pilgrims to see the Pope easily." -Paul VI by Archbishop Pasquale Macchi, p. 65. Rumours are rumours and it will be interesting to see what happens. Link here and hope everybody likes it: http://www.orbiscatholicussecundus.blogspot.ca/. And many thanks to Mr. S. Tribe (founder and editor of the NLM) for helping me out with the new design and other features! There are just a few legends left who can still design and build a Catholic church that actually has the ethos of a Catholic church. Imagine that? You will find yourself in good hands with these legends - the finest English-speaking Catholic church architects of today and that's just the way it is. With the continued pervading tone of change in the Church today this blog has always sought to introduce youth to their Catholic inheritance and to encourage some to study in Roma Beata. Catholics must be taught how to be Catholic. They must connect with Rome. Many thanks to everybody for the advice and I ask to first hear Holy Mass and after I will make a quick decision and let everybody know asap. PS 70 yrs ago today was the outbreak of WWII. Pray and do penance. This blog, sadly, is just now at the end of its course. There is simply no more storage room. 1013 MB (99%) of 1024 MB has been eaten up. But just remember: what was done was done for you. This Byzantine-Romanesque is magnificent and wonderful to see in America! Church of St. Andrew, located in St. Paul, Minnesota. My mother was baptized in this church after the war ended by Fr. John Buchanan (1910-1998). Fr. Buchanan died at the age of 87 but when he was in Europe during the war as an Army chaplain he did not expect to survive, as he later shared. He was, as he once told me, at D-Day where he first raised his hand across the waters to absolve the Catholic Allied soldiers and then the German Catholic soldiers. He was also in the middle of the fight at the Battle of the Bulge and received the Silver Star for heroism. He was a priest who loved the priesthood. Gauge the scope of beauty seen in this temple built overlooking the upper banks of the mighty Mississippi River and be inspired. In contrast, as everybody knows we live in an age of milquetoast church architecture. Indifferent co-religionists are a dime a dozen. And so are dryrot church building and renovation committees who know nothing or too little of Catholic spiritual and artistic influences which they never understood (born of the ages past in large part from the mystical climate of a Catholic continent). In recent years a remnant has worked aggressively for a restoration and an integral part of this effort has been the modern legacy of the Notre Dame School of Architecture. These guys know their stuff and have played a big part in ending the "tyranny" of modern church architecture as we know it. Winning the age for Christianity implies a deep commitment to the best church architecture. Defining the new role today we have a new crop of legends such as Duncan Stroik (http://www.stroik.com/) and Matthew Alderman (http://holywhapping.blogspot.com/) and Erik Bootsma ( http://beatusest.blogspot.com/) who are Catholic architects (men of art who believe and design and build). It's an easy collaboration: you just need pious and generous laity, talented architects who believe and a dynamic bishop or pastor with the guts. The vitality of Western civilization has already taught us what and how to build. Archbishop John Ireland led Minnesota Catholics for 33 years. As a young student he had spent eight years of seminary training in France (Meximieux and Montbel) and this is when he became full of admiration for the splendor of Medieval and Renaissance Christendom. Enraptured with European church architecture he once said: "They were truly monuments of faith and piety, and more eloquently than the most eloquent pages of written history they tell us that in older times the children of the Church were giants in devotion to religion." In the top photo is the Cathedral of Saint Paul located on Cathedral Hill overlooking Saint Paul, Minnesota. The architect was Emmanuel Louis Masqueray, a man who was able to translate into stone the full significance of the meaning of a great Christian temple. With his pencil he drew religion's meaning, religion's history, religion's purposes. Masqueray yielded a score of commissions for the Church in the Northwest and his fine works stand today. His pencilling finger understood Catholic Europe and this helps us to see the value of having a requisite for all serious students of design - they ought to study in Europe. Masqueray was born in Dieppe, France in 1861 and was raised in Rouen and in 1873 the family moved to Paris. In 1879 when he was 17 he entered the Ecole des Beaux-Arts, the oldest and most prestigious fine arts schools in the world. He then went on to live in Italy for two years and during that time he was able to further develop his understanding of historically minded, highly intellectual architecture. In the 1880s he moved to NYC. In 1905 he moved to Saint Paul, Minnesota where he is today buried at Calvary Cemetery. The criteria for proper design used by Masqueray were the same as those used by the French philosophical eclectics earlier in his century to test the validity of an idea: truth, beauty and goodness. The latter two, according to the Beaux-Arts tradition, were achieved by following that classical style so familiar and acceptable to the public, the first demanded not only that a design take into account the vagaries of location and climate, but also, and more importantly, that the exterior of a building clearly relfect the purpose for which it was constructed. Finally, once having achieved its desired state, a design was to never be altered. The aura of timelessness and catholicity remain. He knew his stuff. May he pray for us and for the continued restoration in Catholic church architecture. This is 89-year-old Fr. Paul Marx who was ordained priest in this same chapel in 1947 at the Benedictine Abbey of St. John's in Collegeville, Minnesota. With great joy Fr. Marx spoke of the day of his ordination. Fr. Marx is the founder of Human Life International (HLI) and the "international" pro-life movement. Faithful for Life is the name of his 1990s autobiography. As a pioneer in the pro-life and pro-family movement Fr. Marx made the teaching of NFP to young couples a cornerstone of his ministry. Fr. Marx, who had traveled the world and studied the menace of abortion always said that "Abortion starts with contraception." Fr. Marx is an American saint and it was a great honor to have lunch with him at the Abbey and look forward to seeing him again tomorrow! This is our way. Our tradition. Our Catholic language. We are proud. St. Mother M. Angelica (consecrated virgin in 1947). St. Fulton J. Sheen (ordained priest in 1919). St. Paul B. Marx (ordained priest in 1947). 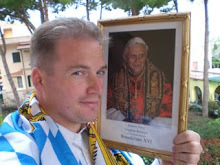 Support her empire of global Catholic TV: http://www.ewtn.com/. And if you can, read Mother Angelica by Raymond Arroyo, published by Doubleday in 2005. "I'm so tired of you, liberal Church in America." World Youth Day, August 14, 1993. Teach your kids team spirit for the Church: and to show it proudly in the face of the world. Rt. Rev. Msgr. Rudolph G. Bandas, S.T.D. et M., Ph.D. Agg. Born in Silver Lake, Minnesota, died in Saint Paul, Minnesota. Ordained priest in 1921. 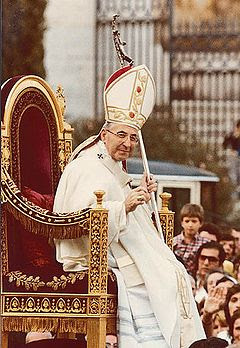 Elevated to the rank of Domestic Prelate with title of Right Reverend Monsignor by Pope Pius the XII on January 15, 1955. O God, grant that Your servant Rudolph, whom You raised to priestly dignity in the priesthood of the apostles, may now be admitted into their company forever. Through Christ Our Lord. Amen. He had been a college professor, seminary rector, pastor and author of many fine books on education. Books which were translated into many languages. Buy one! The splendor of the old papal rites of the Cappella Papale. Too much of this was done away with. Too much too quickly. Now it's time to bring some of it back. Born in St. Paul this is James J. Byrne, Auxiliary to the Archbishop of St. Paul, consecrated in 1947 at the age of 38. Altar containing the incorrupt body of Pope St. Pius X located in the Vatican Basilica. These cards are still somewhere in the sacristy treasury of St. Peter's. It will take the Italians to approach the canons and sacristy staff and to get these back. Pray for the conversion of the Kennedy family. All Christians are to be pro-life. May their mother Rose continue to pray for them. May the splendor of Catholic morals enthrall them to conversion through the grace of the Holy Ghost. Teddy passed away today at the age of 77. In your charity pray for the repose of his soul. I once heard that when Cardinal Pacelli came to the USA in 1936 little four-year-old Teddy climbed up on his lap to say hello when the Cardinal paid a visit to the Kennedy family at their Bronxville, NY home and that Teddy received his First Holy Communion by the hands of the newly elected Pius XII when he went to the Vatican for the coronation of the new Pope in 1939. After the coronation he and the family were received into a private audience with the Pope. Ted was later married by Cardinal Spellman in 1958. A very fine priest Fr. B. Pedersen celebrates Holy Mass in the Gregorian rite at the Church of the Sacred Heart in Robbinsdale, a suburb of Minneapolis. Founded in 1911 the current church was built in 1958 and the current sanctuary arrangement as seen here is the result of a recent and very positive renovation. Earlier this year the option of this rite was added to the Mass schedule and so many countless have said how much this means to them. This is the proof: success. Moms, dads and families with kids. Many thanks from us locals to such a fine, holy, wise and generous pastor! Thank you Fr. Bryan for buying (= saving) this precious antique! For about forty years the Twin Cities Catholic Chorale (founded in 1956) has performed an Orchestral Mass in this famed Baroque church (during the 10 o'clock Solemn High Mass, sung in Latin). This is the Church of Saint Agnes located in Saint Paul, Minnesota (where many of us received our formation, through a special gift of Providence). The parish was founded in 1887 to serve German-speaking Catholic immigrants. The present church is of Indiana limestone and was completed in 1912 and seats 1,500. The familiar oxidized-green "onion tower" rises 205 feet above the ground and is a much-loved city landmark, visible for miles (I look for it every time I land at the local international airport!). It was always an honor to see and meet so many illustrious clergy and other personages who came to town to pay a visit to the Monsignor. So many good times and wonderful conversations. This was our formation and this is how the Lord works. He lives through us, his sons. The priest is a father to many. This was a preeminent priest. He had many spiritual sons. If you're lucky you'll have a good priest-mentor in your youth. I had mine, a wise and trusted counselor. He made me the Christian man I am today. How? Grace, yes. But it was also his love. He loved me. He was forever young. Diligent in prayer. Lover of the Roman rite. Church musician par excellence. Priest of God in toto. A German-American. He loved Viennese church music. He gave us the great treasury of sacred music which the Church has always fostered. Such sterling qualities of leadership he had. It is my earnest wish that by maintaining high Catholic ideals in my daily life I may demonstrate appropriate gratitude to this wise and generous "Shepherd of Souls." Father Schuler, pray for us. And we offer a prayer for the repose of your holy soul, too. While visiting his gravesite I can still hear Schubert, Mozart, Woss, Bruckner, Palestrina, Benevoli, Joseph Haydn and Michael Haydn, Schroeder, Tittel...(and sometimes even Wagner's Ride of the Valkyries!). Wish there was a religious symbol carved on the family stone, but anyways, grandpa's "pa" had this one made and the family members are buried around it. In todays world this takes an effort. Today yours truly saw the famous Fr. Z, and I guess it was a bit like an apparition! This morning while kneeling in an old Irish parish in the city called for the Apostle of the Gentiles there was suddenly a tap on my arm and when I looked up it was the smiling Fr. Z (see and link here: http://wdtprs.com/blog/)! Fr. Z has bequeathed so much to the Catholic of today through his magnificent labors on the Internet and his Catholic blog has proven to be a priceless ornament of our Holy Religion - an engine of apostolic zeal for the glory of Christ's kingdom. In this age of disaster he guides as a faithful and steady guide in teaching people something very important: the way it is and the way it is meant to be. The City of St. Paul has been rightly styled the "Gateway of the West" and this is not only because J.J. Hill built the railway from St. Paul which opened and developed the long stretches of territory between the Middle West and the Pacific Slope, but also because, from its foundation, this city communicated to the Far West an indomitable spirit of enterprise and progress and instilled into its dwellers a habit of original thought. God bless all inhabitants of this noble city, named after the Apostle to the Gentiles! And as for the sister village to St. Paul, first named for St. Anthony and now part of the City of Minneapolis, it had its origin in a settlement near the falls on the mighty Mississippi River discovered by a French missioner, Fr. Hennepin in 1680. Yes, it was in 1680 when the Recollect Franciscan, Fr. Louis Hennepin, at the suggestion of the Catholic explorer, La Salle, risked his life in order to find the source of the Mississippi River; but especially to carry the light of the Gospel to the fierce tribe of Indians known as the Sioux, known to other tribes emphatically as "the enemy." The influx of settlers came, the Irish and German. They remain and we are their progeny, begotten of their prayers and sacrifices for the salvation of the world. Our Lord has pledged so much grace and hope in this modern era and the Holy Ghost is at work. Thanks be to God for faithful warriors! Archbishop James J. Byrne, S.T.D. (1908-1996). My parents knew him when they were kids and they both, along with everybody else, said he was "stern." He was the first Minnesota native to be archbishop. And he was the first ever auxiliary bishop to the Archbishop of St. Paul. And he was consecrated bishop when he was only 38 years old. Episcopal motto: Ad Jesum Per Mariam. Born in St. Paul on July 28, 1908 he was the son of Mrs. Mary Byrne of 1379 N. Pascal St., St. Paul. He had five brothers and three sisters (his brother Tom was mayor of St. Paul from 1966-1970). He attended St. Columba Primary School, Cretin High School, Nazareth Hall Preparatory Seminary from 1924 to 1927, and the St. Paul Seminary from 1927 through 1933. He was ordained to the priesthood June 3, 1933. After studies abroad, Father Byrne received his S.T.D. degree from the University of Louvain in Beligum in 1937. His first church assignment was as curate of the Church of St. Peter in Mendota in 1937. From 1937 until 1945 he was professor of philosophy and theology at the College of St. Thomas, a part-time professor of theology at the College of St. Catherine from 1941-1947, and professor of theology at St. Paul Seminary 1945-1947. During the period 1941 through 1945 he also served as Academic Dean of the College of St. Thomas. On July 2, 1947, Father Byrne was consecrated titular Bishop of Etenna and Auxiliary Bishop of St. Paul. He was the first every auxiliary bishop in the Archdiocese of St. Paul. He became pastor of the Church of the Nativity in St. Paul on February 6, 1948, and he served in that capacity until his appointment as Bishop of Boise, Idaho, June 16, 1956. In 1962 he was appointed Archbishop of Dubuque, Iowa, where he was installed on May 8. He succeeded Archbishop Leo Binz who was installed as Archbishop of St. Paul. As Archbishop he attended the Vatican Council between 1962-1965. He retired in August 1983 and died on Friday, August 2, 1996 at the age of 88. He is buried in the crypt of the Cathedral in Dubuque, Iowa. Archbishop Byrne passed away in a nursing home, Stonehill Care Center in Dubuque where he had been from 1993 until his death in 1996. A pity our clergy, let alone a bishop, often end up like this. We have to take better care of our priests and religious and do our best to keep them out of dreaded nursing homes. Notice the two portable altars? One in front of the throne where the ordinations were held and one in front of the confessio, both where daily Masses were held. And notice, too, the curtains pulled in the baldacchino? Such reverence that only the popes could celebrate Holy Mass atop the main altar. Let Catholic youth know these, our traditions. Nice to see the old altar frontal and altar cards. Pray and do penance with the intention that the Archpriest and canons will opt to have a new altar consecrated in this very spot of the exact dimensions. Bishop of Sioux Falls and later Archbishop of Saint Paul, William O. Brady, D.D., S.T.D. What is done is done here for you. Pope John Paul II in October, 1978. Homes in Catholic Bavaria still sometimes have a big cross in the corner of the common room. As a boy I can still remember when my grandfather instructed me that every statue of Our Lady has a title. This one in the photo is that of Our Lady of Grace. And the Our Lady of Grace statue is the one used for Legion of Mary meetings, too. It's nice to have a corner shrine in the Catholic nest - the statue is a blessed object. And instruct the kids put fresh flowers from the garden in front of it each Sunday morning during the summer months. Very 1930s and very nice. Maybe Swiss lace. Imported. Only the best for the holy of holies. My parents were with him when he passed away in the hospital. He is the priest who baptized me on Palm Sunday, 1979. Pray for the repose of his holy soul. His great joy was to hear confessions, for hours. A good and holy priest. He was my first confessor. Every Saturday I made my confession and he would say: "It was the grace of God which brought you here." According to this book Christ died on April 7, 30 A.D. Yesterday in the mail arrived a parcel...with relics of Pius XII Pont. Max.! Many thanks to the generous priest from Sugar Land who sent these wonderful treasures. And many thanks to the very generous priest from Spokane for his continual generosity which keeps me afloat in Rome. And many thanks to the very generous priest from Dublin for his continual generosity which keeps me afloat in Rome. And many thanks to the very generous priest from London for his generosity. And many thanks to all of the clergy and layfolk who have given to support my being in Rome. The best I can do is pray for your blessed souls at each and every holy shrine I find myself in. And special thanks, too, to the NC family who supports us in our studies and to all others. And to anybody else who would like to give to keep this blog in operation from Rome, a hearty thank you before I return! Question: "Was the [liturgical] reform not done by people who were conscious of what they were doing and well educated in the teachings of the Roman Church?" Answer: "I beg your pardon, but the reform was done by arid people, arid, arid, I repeat it. And I knew them. As for the doctrine, Cardinal Ferdinando Antonelli himself, once said, I remember it well: 'How come that we make liturgists who know nothing about theology?' "
-Exerpt from a 2009 interview of MONSIGNOR DOMENICO BARTOLUCCI, Maestro Perpetuo of the Cappella Musicale Pontificia Sistina who was born in 1917 and who in 1956 was appointed to this post by Pius XII. Nothing like an eyewitness account. The Roman mitre as seen in 1941 on Archbishop John Gregory Murray. Teach your kids about the persecuted Church. Sovietisation entailed tremendous hardship for the Catholics of Ukraine. "The Latin Archbishop of Lvov, a Pole, was brutally expelled and the episcopal See of the little Armenian community was destroyed, but the Ukrainian hierarchy, presided over by the venerable Metropolitan Andrew Szeptyckyj, was not interfered with. In this the Soviets were not showing any deference to religion as such, but were merely respecting the sentiment of the majority of the population who were of Ukrainian origin." -The Red Book of the Persecuted Church by Albert Galter, 1957. Anybody have any leads in regard to the ecclesiology of Paul VI - any books on this? A shine and glow of leadership in his peaceful gaze. A normal looking pectoral cross. The ferriolone cape worn for nonliturgical occasions. Archiep John Gregory Murray, you still inspire us. Dennis Cardinal Dougherty looking fabulous for the 1941 National Eucharistic Congress held in Saint Paul and Minneapolis, U.S.A.
Our song (in English) for the Pope! From the St. Gregory Hymnal and Catholic Choir Book, 1920. Once in August of 1993 my grandfather who was a church organist played this hymn for me after Communion with my dad as soloist to bid me off for the August 11 - 15 World Youth Day in Denever, Colorado. I sat in the front pew with my mother and they made music in the choir loft of the Church of the Assumption. Then at Mile High Stadium at 5:30 p.m. on August 12, 1993 the Pole arrived and that one moment changed my life forever. Haec est summa solutio quaestionis socialis praesentis. Make known the treasures of Catholicism within the context of a Western culture that is in the process of rejecting the Faith responsible for its greatness. Offer an antidote to the universal phenomenon of an accelerating secularism that is hostile to the One True Church and the salvific charge given to It by Our Lord. Disseminate through a variety of disciplines the fullness of Catholic culture and fight against the corrupting influence of the compartmentalization of knowledge. Want your kids to get a Catholic education? Imported from Italy of Cararra marble this statue of the Sacred Heart of Jesus was blessed and dedicated on the feast of the Sacred Heart in 1923. All of these years this statue, by the grace of God, has survived. In my youth I used to pass this staute often and offer a prayer. See what beauty the Church has produced for the edification of Her faithful! "This book saved my priesthood." Dignity And Duties Of The Priest (aka Selva) by St. Alphonsus de Liguori is one of the most significant books which has ever been printed in the history of the world. Yes, it is a must. The Redemptorist Fathers in Brooklyn, St. Louis and Toronto used to print this volume back in the day along with the other works of St. Alphonsus, in English. This volume is a collection of material for ecclesiastical retreats, rule of life and spiritual rules and is volume XII of the complete ascetical works of Saint Alphonsus de Liguori, Doctor of the Church and Bishop of Saint Agatha and Founder of the Congregation of the Most Holy Redeemer. Everybody grows up in the shade of a rectory and this was mine; in my youth I walked by it every day. This one was built in the 1920s. Still makes me proud seeing it as an adult knowing of all the holy men who have lived here and of all the souls who rang the doorbell and received solace/peace of heart. Simply gorgeous. 1936 Chevrolet. $16,000.